The Best Fly Fishing Year Ever? This has been probably my most productive fly fishing year since I started fly fishing. I haven't fished as much as I did in other years but the times I did fish were productive. I had a goal last year of catching at least one fish every month out of the year. I kept that same goal this year. I'm probably jinxing myself because I haven't caught one in December yet. Even if I don't get a fish in Dec this has been a great year. I've put a recap of some highlights from each month. 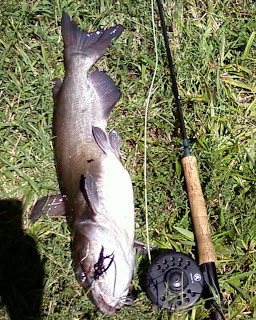 I had another goal of catching not only a fish a month but 12 different species that would measure at least 12 inches. I have never had very good luck in January or February. This year was almost the same. Literally the last day in January I was able to hook this bass. The fish hit a white wooly bugger. 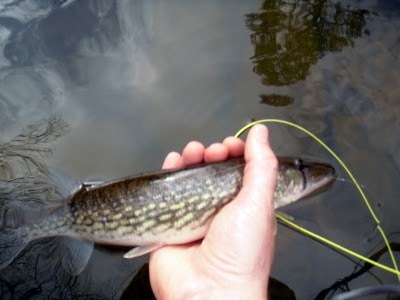 I had heard chain pickerel were active this time of the year but I had yet to actually fish for one. It took two trips to the creek but I found a new species to fish for. 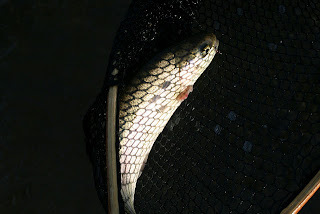 Pickerel are aggressive and slams flies with a vengence. 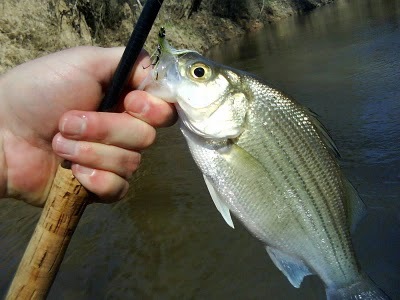 Nothing signals the start of spring as the white bass run. I look forward to this more every year. It is some of my favorite fishing. It's tough to find a type of fishing where you can catch about 40 pound to two pound fish in 2hrs. I have been trying to catch a shad on a fly for a couple years. These fish travel from the ocean hundreds of miles inland. Their nickname is the southern salmon. 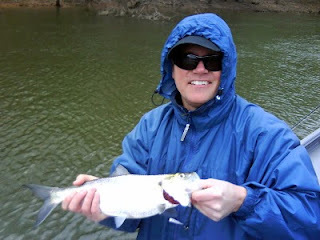 I was lucky enough to go with a TFF member who is a master at catching these fish. He put me on them and I was able to catch my first shad. I figured I had to get my fishing in since my son was going to be born any day. The 13yr Cicada's were coming out in full swing. Some parts of the Triad were deafening with the sound of Cicada's singing. The good thing was fish started to key in on these bugs. Anything large hitting the water around this time was a meal. 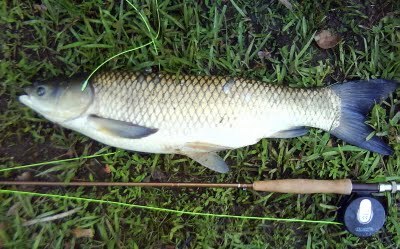 I've gone after grass carp before but never had a chance to really hook one. I was fishing a pond near my house for bass when I noticed some grass carp showing an interest in my popper. Sure enough one inhaled it and I had my first grass carp on the fly. 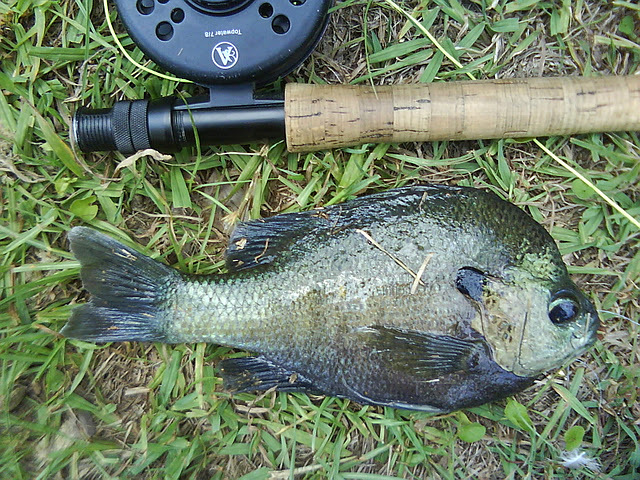 Bluegill and bass fishing really heats up in late may and June. I have been trying to catch a bluegill over a pound for awhile. This gill looked huge and slammed a muddler minnow. I knew it wasn't a pound but I thought it was close to 11 inches. When I measured my reel seat later I found it was only about 9. 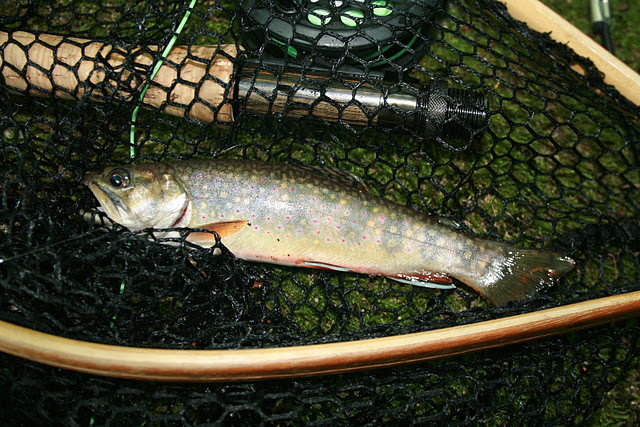 I have caught wild brook trout in the Sierra Nevada mountains but I have never caught them in the east. My wife had a family reunion in the Shenandoah Valley and I jumped at the chance to catch a wild brookie. 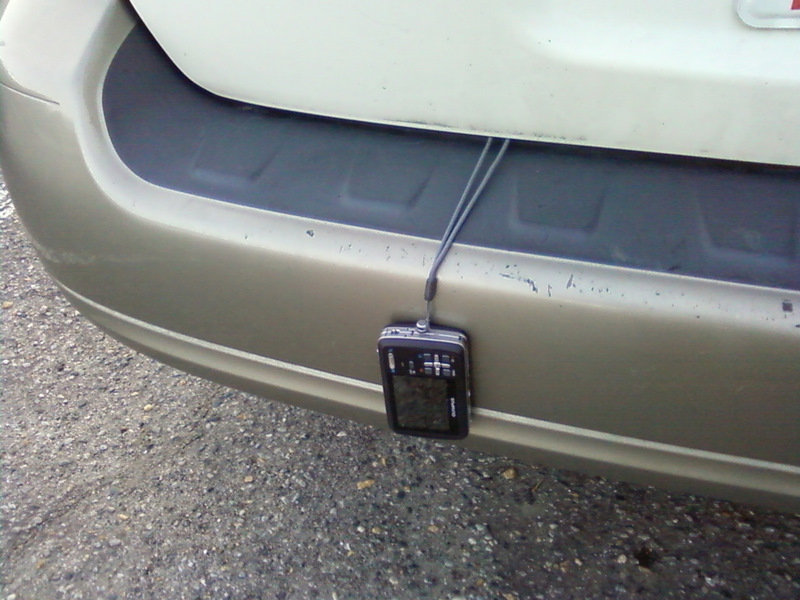 I have to give a lot of thanks to the South East Fly Fishing Forum. A member there gave me a tip on a good brookie spot. It was by far the best place I fished the whole week I was in the valley. The trout were beautiful and I got to really break in a new 3wt I purchased. All I think of when I think of August is hot temperatures and catfish. One week in August I caught 3 catfish in 3 different places. All fish were caught with a dead drift presentation. When I say dead drift really I mean I cast out and did nothing. Didn't twitch the fly or move it. The fish slammed the fly a few seconds after it landed. This guy was my biggest cat so far. This fish had been avoiding me for years. When I finally caught a roanoke bass I was in denial. 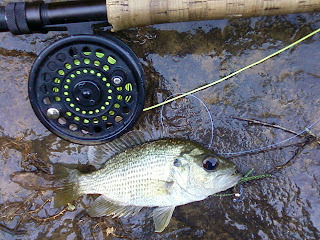 I took a few pics released it and figured I caught a really green sunfish or some crappie-warmouth hybrid. 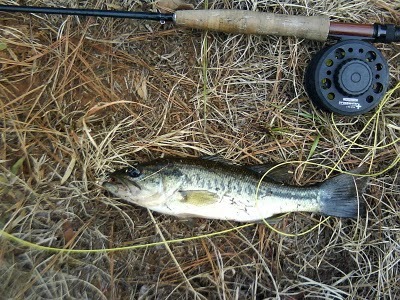 When I finally got home and studied the pictures I realized I had in fact caught a Roanoke Bass. It was a special day for sure. It's great to catch different species but at least a few times a year I have to go after trout. I love fly fishing for trout. It's almost impossible to be in a bad mood while trout fishing. I feel really blessed that I have so many places to fish. I've lived in NC for 5yrs and I've probably just scratched the surface of all the fishable trout streams. I found a great new stream that is close to home. The fishing has been excellent and it is a great place to take beginners. This month hasn't been good to me. I've fish a couple times with nothing to show for it. This last trip I even resorted to..... gulp..... spin fishing. I was striper fishing and the fish were down around 40-50ft. My last chance will reallly depend on a lot of different factors. Weather being one and my wife the second. You can see from all these trips I have gotten time to fish and I have to thank my wife and family for tolerating my absence on weekends. I'm hoping to get out for one day this weekend and go after wild brookies in VA. If it snows I'm done. If the weather stays above freezing I might get lucky. We'll see. The catches weren't the only thing to make this year great. I also was blessed with a new baby boy. My mother picked up fly fishing this year and it is fun to share our love of the sport together. In the end no matter what happens in December this has been with out a doubt my best year of fly fishing ever. 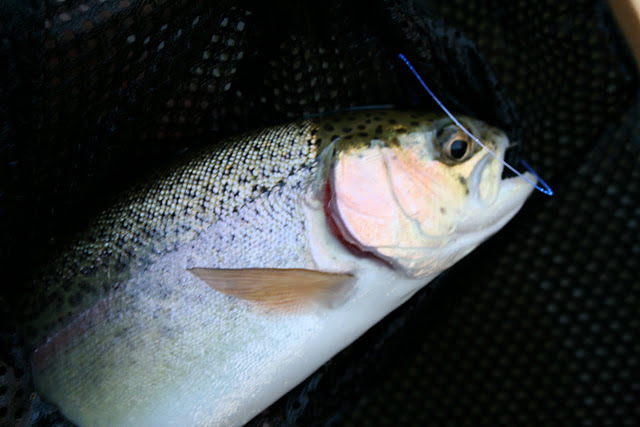 Fly Fishing Gear Made in the U.S. I recently read a post on the blog Fishingthroughlife. It was about supporting U.S. manufacturers when purchasing fly fishing gear. I took this post to heart and started to really research which companies manufacture their products in the U.S. It wasn't really that easy to find. I finally found this site. It goes over quite a few companies and also asks questions about why we can't get more products made in the U.S. Definitely check out the part about hook production. This holiday season when thinking about gear purchases I'm definitely going to look more into where things are made. Doing small things such as buying things made locally or in the U.S. can make a big economical impact over all. Labels: Buy American Made, fly fishing gear made in the U.S.
Like when you drive over 100 miles, go to gear up and see this. The camera survived and the fishing was pretty good too.